Prepare you earmuffs and mittens because Farm Frenzy is back and this time they have chosen a slightly chillier location! In Farm Frenzy 3: Ice Age, Scarlet is back after deciding that due to strained economical times in the West, opening an arctic farm could be a good investment! 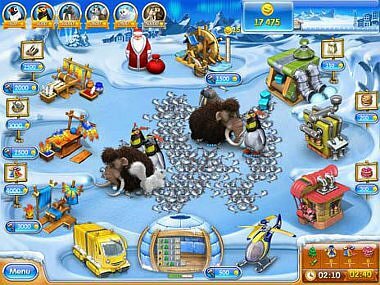 As with all Time Management games, the aim of the game is to make money, and in Farm Frenzy 3: Ice Age, it’s done in a very simple way; By feeding the penguins they produce eggs which you can either sell or use to make egg powder, which you can also sell or use to make cookies. The cookies in turn can also be sold or used to make cakes. Sounds easy, right? Things get hectic rather quickly and each level adds another challenge. From very early on you need to juggle feeding the penguins, collecting their eggs, baking cookies and cakes, ordering flour via helicopter, keeping track on warehouse space and delivering your produce by sled to buyers. All this whilst protecting your farm animals from evil predators looking for an easy lunch! Each level adds another challenge and requires you to upgrade your farm to meet the demands, whether this is an Egg Powder Plant or a Cookie Bakery that bakes at double the speed. Unfortunately, if you lack the money to upgrade, you must go back and redo the previous level. If however, you have cash to spare you can improve your chances in the next level even more by buying add-ons like extra strong cages that capture those pesky polar bears coming to hunt your livestock (which you can then sell to earn an extra dime) or a larger warehouse to stock all the goodies you are producing. But fear not, upgrades can also be bought during gameplay; for instance adding a penguin incubator, which produces more penguins from eggs or changing your sled to a truck, which drives faster and carries more goods for you to sell. The game also grants you awards; some are given for simply playing the game like purchasing 10 mammoths or selling 100 polar bears. And some awards are based on special skills or patience; for instance completing a bear-infested level without clicking on a single bear or for completing a level without using any tips. Although you start the game in Career Mode, you can switch across to Endless Mode after you have completed Level 45. This requires hitting your goals as quickly as possible to get through to the next stage without additional gameplay. With great graphics and challenging gameplay Farm Frenzy 3: Ice Age is super addictive and it will keep you on your toes with hundreds of levels of fun! 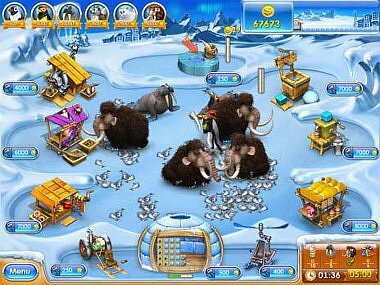 Download and play Farm Frenzy 3: Ice Age for FREE! best game EVER!!!! so much fun! cool havent tried it yet??????????? I have a crush on a boy named ?????????? I love this game.It’s AWESOME!!!!!!!!! Oh my gosh! I really love this game! I totally recommend it, have a go!